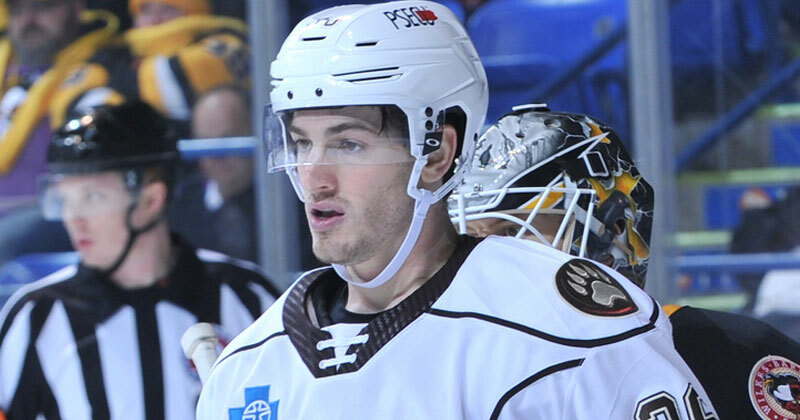 01/19/2019 - Jayson Megna scored twice, and Aaron Ness tallied a career-high three assists in a 5-3 win for the Hershey Bears over the Wilkes-Barre/Scranton Penguins on Saturday afternoon at Mohegan Sun Arena. The victory marked Hershey's sixth win in nine meetings against the Pens this season, and extended their current winning streak to a season-best four games. After going the last three games without a power play goal, the Bears tallied three times on the man-advantage. Mike Sgarbossa opened the scoring with a power play goal at 8:10 after burying a cross-ice feed from Riley Barber to the left wing. Sgarbossa's goal was his 18th of the season, only one goal short from tying his career-high set in 2012-13 with the Lake Erie Monsters. In the later stages of the opening frame, the Bears cashed in after beating an icing call in the offensive zone. After a stretch pass into the offensive end, Brian Pinho used his wheels to keep the play alive and fed Jayson Megna behind the net. Shane Gersich teed up a centering pass from Megna past Pens goaltender Anthony Peters to provide Hershey a 2-0 lead at 17:26. Shots after 20 minutes were 11-6 Bears. Next period, the Penguins took advantage of a full 5-on-3 power play to cut their deficit in half. Ilya Samsonov was finally solved and saw his shutout streak end at 159:51. After Gersich and Liam O'Brien were both handed minor penalties at 11:33, Adam Johnson buried his first of two goals on the rebound following a Jean-Sebastien Dea shot at 12:44. Shots after 40 minutes were 23-15 Hershey with a 2-1 lead in hand. Into the third, both teams traded three goals within the period's first 5:51. First, Megna converted on a power play at 2:10 for his second goal of the night and sixth against the Pens this season. Megna sneaked into the low-slot and redirected a pass from Sgarbossa into the cage to extend the Bears lead to 3-1. Wilkes-Barre answered on a power play goal of their own in similar fashion. At 3:53, Teddy Blueger crept into the slot and fired a quick shot past Samsonov to again bring the Pens within one-goal. The Chocolate and White continued to control the momentum swings and answered at 5:51. Barber sniped a shot on the power play from the right circle which glanced inside the goal post for his ninth power play tally of the season. The Bears special teams continued to produce offensively, but the fifth goal came virtue of the penalty kill. Down a man with a 4-2 lead, Beck Malenstyn chipped a forward pass into the neutral zone for Megna. After powering his way through the defense for a breakaway, Megna guided a sneaky shot through Peters' five-hole to give the Bears a commanding 5-2 cushion at 16:02. The shorthanded goal is only the Bears second this season. Johnson scored for the Penguins on a 2-on-1 at 18:26 to limit the damage, but the Bears hung on for a successful 5-3 victory. Hershey's record versus Wilkes-Barre this season improved to 6-2-0-1 through nine of 12 games. The Bears see their record improve to 19-20-0-2 with a chance to climb to .500 in their next game. Hershey will next take the ice on Monday, January 21 for a 1 p.m. road tilt against the Bridgeport Sound Tigers. Both teams will battle in a game rescheduled from Sunday, January 20, due to winter weather conditions. Voice of the Bears Zack Fisch will have the call on the Bears Radio Network.